If you are into live video production you are familliar with the broadcast control surfaces that allow you to control the video switcher. If you use a software based video switcher then you know there is not a good solution for software based systems. 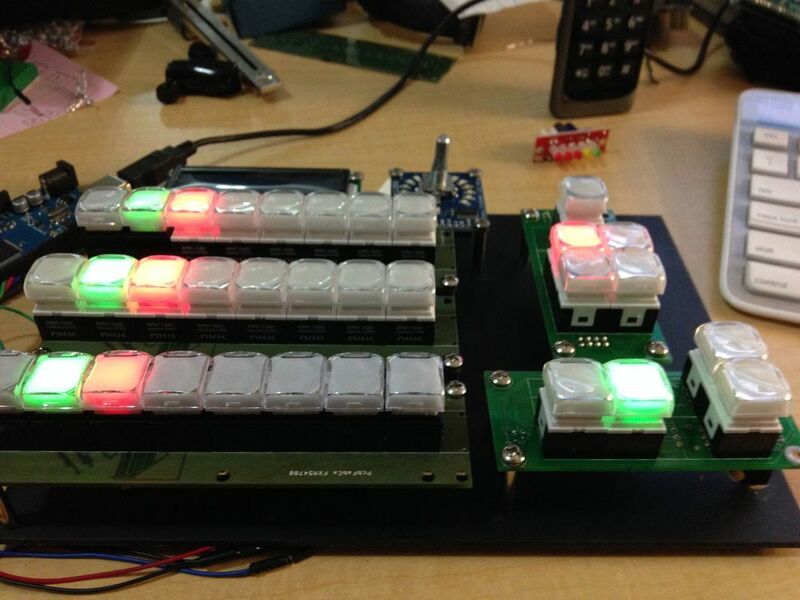 There are some hacked together solutions that use inexpensive MIDI controllers, etc. but nothing that is of the "broadcast" quality. This project is designed to solve this problem plus add a bunch of new features. For this project I have submitted 3 patent applications for one of the features that will be available with this control surface. The control surface also has MIDI and Serial control output and will hopefully have keyboard macro output soon. The cool thing is this can work with all of these devices at the same time. This was done because I currently use an ATEM to switch video and Wirecast to do the graphics, DDr and streaming functions. From one control surface I can now control the entire workflow. The control surface uses high quality broadcast LED backlit buttons like you find in the high end switcher control surfaces. The hardware and software is basically done except for any new features we decide to add. At this time we have the console enclosure being designed, once that is done and the manual is complete we will start selling this first version as model c200 and will be available at h3j.com once we get the site up. Below are some pictures of the switcher in use in our studio. It is still in the homemade inside out case that we use to develope with but it is still pretty cool. When we get the first enclosure we will be sure to add photos. We will have a number of different configurations that range from small desktop designs for producers to small console for the switcher to larger consoles and even rack mount devices that can switch and even control matrix switchers. You will be able to see all of these configurations on h3j.com. With this control surface you can upgrade yoru switcher hardware or software and continue to sue the same control surface, so your investment in the control surface grows with you. Our control surfaces can report to a cloud based service to report Tally information. Because I am involved in internet broadcasting, so many times our guests are connected via some remote system like Skype. The guest does not know if they are live or in preview ready to go live. By reporting to the cloud, we can use either a remote tally light or web based information system to update them. BTW... I have each of those options available now. We can take this one step further. If the remote guest has more than one camera for maybe a product shot or some other camera angle, either they need to switch using a hardware or software solution or switch the camera in Skype or whatever software is being used. Using the same cloud based technology, we can control from one control surface a switch that local and and number of switches that are remote. So from our studio in Maryland we can control a video switch in Texas right from our regular control surface just like it is a local camera. We have a few more features already in the software that we still need to file patents for so we cannot list them here but we will soon.